The Florida Library Association has a long and fascinating history and its records are maintained in the Special Collections Archives in the University of South Florida in Tampa. The Florida Library Association can trace its origin back to 1901. In the early years, meetings were held in conjunction with the Florida Education Association, since most of the members belonged to the teaching profession. Miss Carolyn Palmer of Stetson University, a full time librarian, is credited as one of the original organizers. The first conference was held in Miami in 1905 and the first pre-arranged program meeting (for five years there were just business meetings) took place in St. Augustine in December 1906. This initial association lasted until 1908. After a lapse of more than ten years, Miss Helen Virginia Stelle, Librarian of the Tampa Public Library called an organizational meeting of the Florida Library Association in Orlando on April 26-27, 1920. Apparently unaware of the activities of the first group, the 23 persons who attended the meeting in 1920 signed a register as “Charter Members of the Florida Library Association.” The newly formed group voted to affiliate with the Southeastern Conference of Librarians and with the American Library Association. The formation of the group was slow going, but a steady few met and eventually they began to grow in strength. Conferences were held in various parts of the state, including one at the home of Melvil Dewey in 1934. Conferences were suspended for three years between 1943 and 1945 because of World War II. Since 1946, when it was reactivated, the Association has enjoyed a steady growth, and, including this conference has held 95 conferences! The 50th annual conference was held in St. Petersburg under the theme “Florida Librarians Coping with Change.” The 70th conference was held in Daytona Beach “Partnerships for Success.” For many years (prior to the establishment of MLC’s and the advent of the internet) the FLA annual conference was the primary staff training and CE resource for librarians in the state. Conference themes over the years have included: Florida Libraries Come Alive (1947); Do it Now! (1974); Each One Reach One (1991) and Better Together (2006). A tradition of legislative action was given impetus when The Association’s first objective was the establishment of a state library agency; its second was the enactment of legislation to permit the establishment of county libraries in Florida. Largely as a result of its efforts, the present State Library was established by an act passed in 1925 and implemented in 1927. Passage of a permissive county library law followed in 1931. Another of its accomplishments was the construction of a building for the State Library, which was housed in the basement of the State Supreme Court Building for many years. As the state’s leader in library advocacy, FLA engages a lobbyist to advocate on behalf of libraries of all types. Lobbyists over the years have included Jody Fitzgerald (reknowned for her fashion and hats!) The law firm of Lewis, Longman and Walker (from 2008 – 2017) and now the law firm of Gray Robinson. In 2006, FLA filed an amicus curiae memorandum in the US District Court in support of an ACLU and Miami-Dade Student Government Association lawsuit. The Miami-Dade School Board removed the book “Vamos a Cuba” and “A Visit to Cuba” Book series from the Miami Dade School Board libraries and classrooms. In early 2009, the 11th Circuit Court of Appeals reversed the decision to return the book to the school libraries. FLA’s scholarship program has been another integral contribution from the organization. Beginning in 1989, FLA has given out countless opportunities to library students over the years. Excellence in the field is honored by FLA with their prestigious awards in categories such as FLA Leader of the Year, Librarian of the Year, Library of the Year and Lifetime Achievement award, and many more! On May 2, 1966, the Association was incorporated by the State of Florida. FLA is a chapter of the American Library Association, but it is separately incorporated as a Florida not-for-profit organization. As a 501©3, donations to FLA are tax deductible. 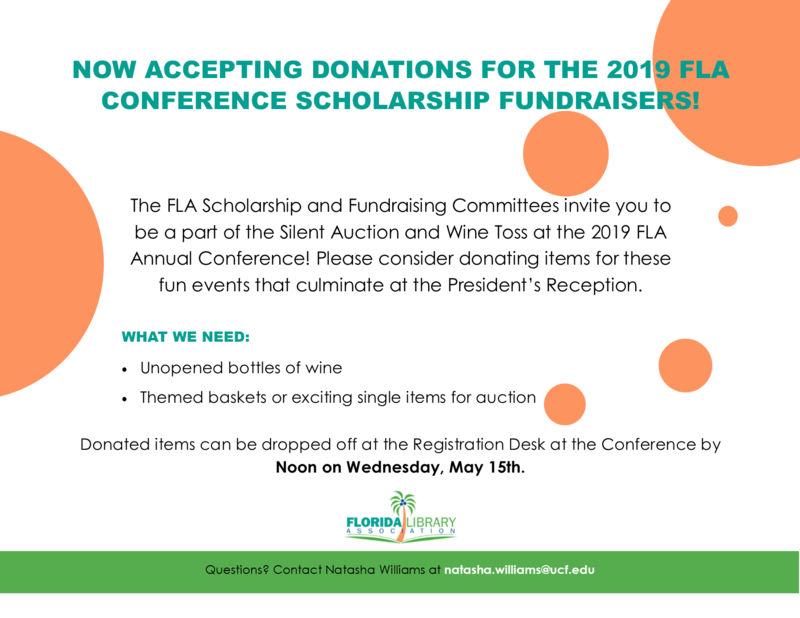 To support its programs and services, FLA depends on member dues, conference exhibits and sponsorships and donations. In turn, FLA provides a central point of contact for librarians, which is the very essence of professional associations. In 1927 FLA began publication, at regular intervals, of the Florida Library Bulletin, which continued until 1935. The opening line of Volume 1 Issue 1 reads, “Bearing a message of friendship and of appreciation of what Florida Libraries are doing, the Florida Library Bulletin makes its appearance during this year of the celebration of the 50th anniversary of the American Library Association.” It was succeeded by sporadic mimeographed newsletters until the establishment of the present Florida Libraries in 1949. In 2010 Florida Libraries migrated from print to online, but digitized back issues are available through fcla.edu. In addition to the newsletter, FLA began a web presence around 1997-98 with a published web site. While providing leadership at the statewide level, FLA also provides its members with volunteer opportunities to develop personal and professional leadership skills. In its earliest years, FLA was entirely dependent on volunteer leadership to conduct its business as an association. From the late 1970’s until 2005, FLA’s day-to-day operations were handled by an executive secretary employed with an association management company, Crow-Segall. In 2005, FLA contracted with long-time FLA member Ruth O’Donnell to become its first executive director. Ruth worked from her home in Tallahassee while NEFLIN in Orange Park, managed FLA’s business office under a separate contract. Faye Roberts, a seasoned library director and library supporter, succeeded O’Donnell as executive director and became FLA’s first employee in June, 2008 when FLA’s first office was opened in Lake City. Faye retired in January 2014 and Martina Brawer became the executive director and the FLA office was relocated to Tallahassee. Martina left in October 2016. Dawn Pollock became the interim executive director in November 2016 and stayed with us until March 2018. Now we are blessed to have Lisa O’Donnell as our new ED, starting March 1, 2018!